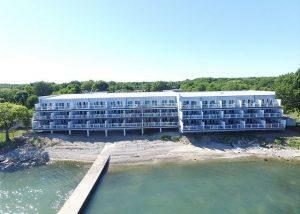 The Put-in-Bay Waterfront Condos are luxury island living at its finest. With waterfront views, swimming pool, and perfectly appointed condos, your perfect Put-in-Bay vacation starts here. Make a reservation here to book one of these exquisite condos! Whether you vacation with a crew of your closest friends or take a break with your family, The Put-in-Bay Condos has everything you need. Located right next to the airport, this is some of the best real estate of the island. Besides the azure pool, there is a volleyball court, barbecue grills, and golf cart rentals on-site. Guests access their homes through coded door locks. The interior of the condos are stylish and comfortable. The sliding glass doors allow the light in and each unit includes flat screen TV’s. The Put-in-Bay Condos are an ideal choice for your next corporate getaway. The relaxed vibe of Put-in-Bay is a welcomed retreat from the fast paced business world. There are plenty of activities on the island for team building activities and when it is time to relax, Put-in-Bay is full of delicious restaurants and a lively nightlife. Take your golf cart into downtown and take advantage of everything Put-in-Bay has to offer. From jumping nightclubs like The Green Room, neighborhood bars like Frosty Bar, and cuisines from crepes, to Florida specialties, and of course, all the perch and walleye you can eat, no one goes hungry on this island. There’s something for everyone on Put-in-Bay, from the fisherman, to families and even history buffs. An important location during the War of 1812, there are plenty of historical sites to tour.